My cat licks herself constantly, to the extent that she has bald spots on her belly and at the base of her tail. I don’t see any fleas on her at all. What can I do? Thanks for contacting us about your cat and the licking. Firstly, I would like to agree with our vet, that you cat certainly could have fleas. As she says, even one flea can cause problems, and in many cases the owners do just not see the flea. The flea could jump on, bite and then jump off. As a precaution, I certainly would get your cat on a flea programme. Then, secondly, many animals bite when they are in pain. You cat may have injured the back area of the spine, or even further up or even the tail. A tingling sensation can be very irritating and the cat tries to stop the tingling and bites or licks. So once again, I would suggest that you need to visit your vet and have the cat checked for no signs of pain. Before any behavioural changes take place it is always advisable to take the animal to the vet for a thorough check-up so that you are 100% sure that the behaviour is not to do with something medical. You have said that your cat is highly strung and I believe there is probably tension between the two cats. You, yourself have said that he is causing you a lot of irritation. This goes straight to the cat and causes a lot of stress – cats can lick when they are stressed. If you don’t want him to wake you at night, then put him somewhere else where he can’t wake you up – shouting will not help, it will only stress him out more. Put him in another room, leave some food and a nice place to sleep and leave him there – he doesn’t have to sleep with you. Sometimes, we think that two cats are getting on together, but it can be just the opposite, and maybe a change in home where he could be on his own might be what he wants. If you have a behaviourist in your area, you could also ask them to come to your home and assess the situation. 2 Responses to "Cat Licks her Hair Off"
Chronic lick lesions in cats can be frustrating to deal with. Most topical products are not safe if swallowed in high quantities. 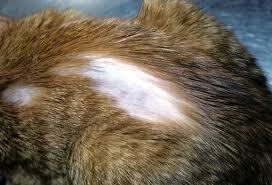 I would take her to the vet – lipping the hair short can help dry the lesion out around the wound. I would use the buster collar until you can get her there, but your vet will probably prescribe medication to be taken in pill form to control the itching. Hi I also have a similar problem and plan on taking my cat to the vet in a few weeks when I can afford to, but I was wondering if there is any hotspot treatment that is safe for a cat. I see them all the time for dogs, but I haven’t found one that says it’s for cats. I have a cone that I’ve been putting on her to reduce her constant licking, but I feel like there might be something else I can do to help her in the meantime. I just hate seeing her like that.